SAFE-T® Plastic for a safer and more durable instrument. The opening in the Direct View™ compass point provides for the easiest, most accurate location for all circle constructions. 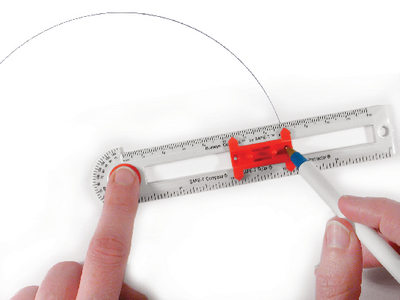 Quick-Set™ radius indicator allows immediate comparison of inches and centimeters and setting adjustments without removing the compass from the drawing surface.